IQAir HealthPro Plus, IQAir HealthPro Compact, IQAir GC MultiGas. IQAir’s air purifier family alone gives you three excellent high-end choices to chew on, and that doesn’t even account for other excellent IQAir Atem for personal use. So where to start? Yes, today we will start with an IQAir HealthPro Plus Review (also known as IQAir HealthPro 250) to help you make better decision which high-range air purifier you should pick. With 50 years of experience in air purifier industry, IQAir is truly a monument for everything about air cleaning innovation and expertise. Their proud device – the IQAir HealthPro Plus alone has won 6 consecutive awards by reputable organizations like Best Buy Consumer Digest, Extreme Makeover, Allergy Buyer Club. IQAir HealthPro Plus (or called IQAir HealthPro 250 in Switzerland) is a powerful and almost flawless air purifier. And the fact that it is more affordable than its sibling IQAir GC MultiGas makes this air purifier a more desirable. But first, let’s scroll down to our IQAir HealthPro Plus Review to check this device thoroughly. 1, IQAir GC MultiGas Review. 2, IQAir HealthPro Compact Review. IQAir is a brand that only relies on and innovates their two prior air purifiers, this IQAir HealthPro Plus and the smoke-targeting IQAir GC MultiGas. As one of two flagships of the high-range IQAir brand, IQAir HealthPro Plus will not be easy to pick up. IQAir is calling it the future of the air purifier, the embodiment of what they have been trying to achieve for a decade. But while the IQAir HealthPro Plus is all about premium parts and an all-new experience, it’s a huge gamble for the IQAir brand, as it tries to reclaim some leadership in air purifier innovation, with a rocket high price. The IQAir HealthPro Plus starts at $899, which is only 2/3 the price of the IQAir GC MultiGas. However, this air purifier still cost you $150 to $200 when compared with other high-range air purifiers like Blueair Classic 605, Alen BreatheSmart 75i or AIRMEGA 400S. Other mutual competitors with this IQAir HealthPro Plus is Blueair Pro L, Airpura UV600 and Oransi EJ120. It’s impossible to give a perfect score to something that costs this much – but this is the closest to smartphone perfection IQAir has ever got. But I believe that if you want to pay $900, you should stay with this IQAir HealthPro Plus – the air purifier of both best power and design. #1 Rated room air purifier for allergies & asthma. The IQAir HealthPro 250 has received more top reviews and awards than any other air purifier. Sitting alongside the GC MultiGas as the flagship device from IQAir, the IQAir HealthPro Plus has exactly the same design with the excellent sibling air purifier. With the IQAir HealthPro Plus, IQAir introduced a smart design that is unique through market-wide. A 28-inch air purifier with curves at the bottom, to make it more compact for the users. It was a much-needed change in a market where air purifiers had started to feel stale. The IQAir HealthPro Plus uses a full stainless steel body, following by a bottom-to-top air flow structure and an optional set of 4 wheels. All of the materials used for this air purifier are Swiss made, with outstanding quality and durability. The bottom line of the Swiss-made definition is the 3D Ultra Seal technology, which prevents air from escaping out without purifying through 3 parts of manufacturing process. First, this technology ensures that the filter media is 100% sealed in the filter frame. Second, 3D Ultra Seal technology also guarantee knife-edge-in-groove sealing between filter frame and housing. And finally, each unit will have an airtight housing. 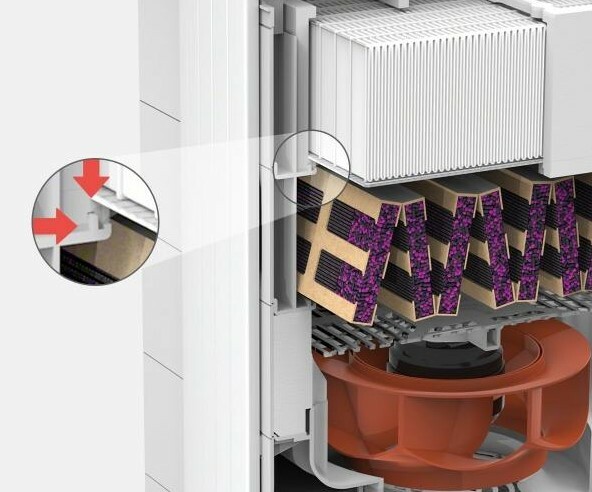 The bottom-to-top air flow is done with a big intake air vent at the bottom, which draws the polluted air through a process of air filters and releases out from the 320 Degree air outlet from the top. This is called EvenFlow Diffuser technology, which makes air filtration process quietly and evenly distributed in all directions. There is no air purifier using the same outlet air delivery like the flagship devices of IQAir. Also, on top of this IQAir HealthPro Plus is a 4-key touch-pad with 16 character 2-line LCD display here. From both front and back of IQAir HealthPro Plus is the signature locking arm with 3D Ultra Seal to completely seal the air purifier. There are two different colors available for the main locking arm to choose, which is light gray or white. As a powerful air purifier for large room and extra-large room, IQAir HealthPro Plus is big enough with 35 lbs in weight. This number is 10 lbs lighter than its brother – GC MultiGas. Sadly, for a huge machine like these air purifiers for large room, we can’t find a better air purifier with less weight. If you still find this IQAir HealthPro Plus is too heavy to move, you can make use of the 4 casters which is included in the box. The IQAir HealthPro Plus has a limited edition – the IQAir Klaus Series. This edition is hand-crafted with solid Pistachio wood paneling and accents, making it have deep, rich grain and coloring. But you should check for a bump in the price of this IQAir Klaus Series Limited Edition. PreMax filter – A powerful pre-filter which can reduce most of the large objects of airborne pollutant particles and protect the subsequent filters. Granulated Activated Carbon filter – Eliminates volatile organic compounds (VOCs), smoke, odors and other harmful chemicals. Pelletized chemisorption – This filter is added into the Activated carbon filter, to further destroy the harmful chemicals such as formaldehyde. 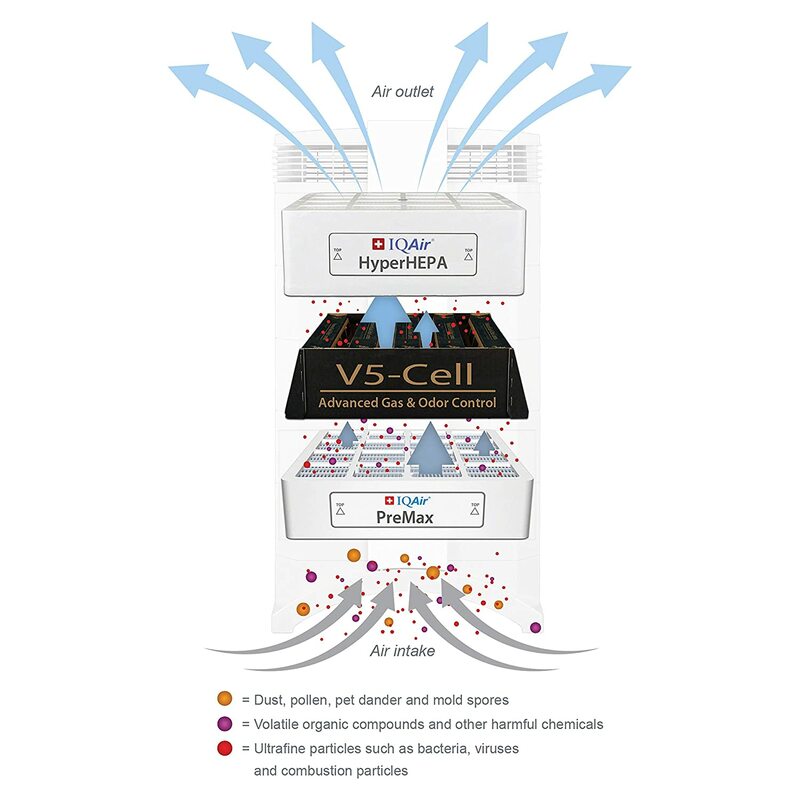 HyperHEPA filter – The #1 True HEPA filter which can filter out both fine and ultra-fine particles, including bacteria, viruses and combustion particles. As you can see in the 4-stage air cleaning system above, IQAir HealthPro Plus only uses the mechanical filters and doesn’t emit any ozone or ions (which can cause asthma) to your home air environment. Instead, IQAir company brings out the next level of mechanical HEPA air filter. Starting with the PreMax filter, a certified HEPA pre-filter which has efficiency of 55% at capturing as small as 0.3 microns. This pre-filter is washable, but is not permanent and need to be changed after 18 months of using. V5-Cell is the name of the combination of the granulated activated carbon filter and the pelletized chemisorption. This 5 lbs activated carbon filter is necessary in controlling of a wide range of chemical contaminants and odors. This filter can last for up to 2 years, thanks to the reduction of fine particles in the pre-filter. Finally, the reason why this IQAir HealthPro Plus dare to claim “#1 Rated room air purifier for allergies & asthma” is because of the perfect HyperHEPA air filter. This HyperHEPA H12/13 is a non-woven glass microfiber, non-offgasing separators True HEPA filter which can capture 99.97% of down to 0.3 microns airborne particles. Most importantly, this HyperHEPA is tested to capture even the tiniest ultra-fine particles, with 95% of down to 0.003 microns in size. Note that this powerful efficiency is only happened in the surface area of 54 sq ft around the IQAir HealthPro Plus. IQAir individually tests each and every IQAir HealthPro Plus at the factory to ensure that its performance meets their specifications. They claimed to use an electronic laser particle counter to verify that your HyperHEPA filtration is meeting our exacting standards in reality. The results of the tests are detailed in a hand-signed Certificate of Performance, which is shipped in the box with every IQAir HealthPro Plus air purifier. In Breathe Quality, we don’t have the powerful electronic laser to test the IQAir HealthPro Plus, but our strict physical test indicated that this air purifier is indeed one of the most powerful at the moment. You may wonder about our test? It is quite simple, the testing conditions are one room of specific 500 sq ft, and the duration of 1 hour. I let the IQAir HealthPro Plus, Blueair Pro L and the Airpura UV600 run at the same time, to compare the actual performance between these top-class air purifiers. But the final reason is a bit easy to guess, as all of them have the highest efficiency I’ve ever seen. The IQAir HealthPro Plus and Blueair Pro L can capture 99.99% of all pollutant particles as small as 0.3 microns. The Airpura UV600 is only slightly down with an amazing score of 99.97%. Only one downside, the HyperHEPA filter is not easy to afford. You must pay for $380 for the full set of PreMax, V5-Cell and HyperHEPA filters of this air purifier. Luckily, you don’t need to change the medical-grade HyperHEPA air filter annually. Thanks to advanced technology in the air filtration, the HyperHEPA H12/13 can last for 4 years, based on average daily usage of 10 hours. This durability is at least 4 times a normal True HEPA filter, and therefore reduce the annual filter replacement cost efficiently. This high-end IQAir HealthPro Plus is perfect for an extra-large room. The room coverage of this air purifier is 1125 sq ft, just like any other IQAir’s flagships. Don’t satisfy with this huge room coverage? You can opt-in for the Austin Air Bedroom Machine with 1500 sq ft, or the Airpura UV600 with 2000 sq ft. They are both in same price range with IQAir HealthPro Plus. The ACH of IQAir HealthPro Plus is an amazing 5X rating. This air changes per hour rating allows the device to clean your room once every 12 minutes. The CADR of IQAir HealthPro Plus is a top-notch 776 cfm in overall. With the New Edition fan, IQAir HealthPro Plus can deliver up to 41% more clean air. 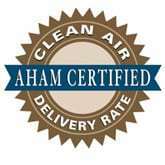 This CADR rating is also one of the highest available in the air purifier market in 2019. A high fan power air purifier normally runs noisily. However, thanks to the aerodynamics fan design and an addition of 8 shock absorbers, IQAir HealthPro Plus operates very silently. With 6 fan speeds, IQAir HealthPro Plus runs 22 db at lowest settings. This noise level can be compared with the Breathe Quality’s best air purifier in 2019 – the Rabbit Air MinusA2. For your imagination, the 22 db is just the same noise level as the whisper, or the rustling leaves. Interesting, right? At the highest setting, IQAir HealthPro Plus only produce a noise level of 57 db. This is an overall impressive result for a large room air purifier like IQAir HealthPro Plus. If you prepare to purchase this air purifier, you will not be disappointed with its silence. As one of the most criteria when deciding to buy an air purifier, one of our most FAQs is “Do air purifiers use a lot of energy?”. 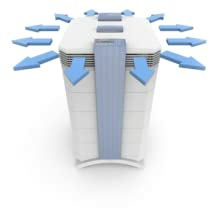 In fact, an air purifier needs to run for a long time (usually more than 8 hours) to be efficient. At lowest setting, the power consumption of IQAir HealthPro Plus is just only 20W (and only 1W for standby mode). However, if you push the air purifier to the highest setting, it will consume up to 135W. The average energy consumption of IQAir HealthPro Plus is recorded at 70W. If the high energy consumption is a problem to you, this IQAir HealthPro Plus is at the moment the best energy-saving. It is difficult for a powerful air purifier to run with low energy, right? Let’s have a quick math, for using IQAir HealthPro Plus 8 hours per day, you will need to pay from $7 to $48 annually, depending on which mode you run the most. IQAir HealthPro Plus is a high-end air purifier, coming with the latest additional features from the modern air purifying devices. The most anticipated feature is the Smart Sensor, an ability to automatically adjust the fan speed according to the actual air quality in your room. Running IQAir HealthPro Plus with Smart Sensor will help reserve the energy and increase the filters life time. To control this air purifier, you can use the personal remote control which is packing within the product box. Just like the IQAir GC MultiGas, IQAir HealthPro Plus also has the additional features like an Advanced Timer (to program of operating hours and weekdays) and an Advanced fan speed selection to set up a fixed fan speed at a desirable time period. In addition, this air purifier comes with a LED filter replacement indicator to remind you when to replace your filters. With 50 years in this air purifier industry, IQAir is clear of their mission than any other brands. They have been awarded for a lot by many reputable organizations and press articles. With an expert support team to work 24/7, you can reach IQAir easily via email. 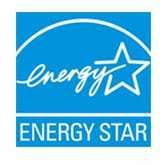 Their air purifiers always have a 5-year warranty, the highest time period to guarantee no defect at all. For the high-end machines, 5-year warranty period is also recommended. With a more reasonable price tag, IQAir HealthPro Plus is once again likely to be the best air purifier of the year. But I must admit that the price is still too high to consider, especially when you don’t have an extra-large room in your home. Should I buy IQAir HealthPro Plus? Yes, and once you can afford the high-range products, you should never forget the name of IQAir. IQAir HealthPro Plus is an overall powerful True HEPA air purifier, and it can clean even the particles as small as 0.003 microns. If you have serious allergies or asthma to airborne pollutants: the IQAir HealthPro Plus is the best machine you can get. If you want a better performance, or better fan power to clean your room faster: this is the best air purifier you can get for both the performance and fan power. 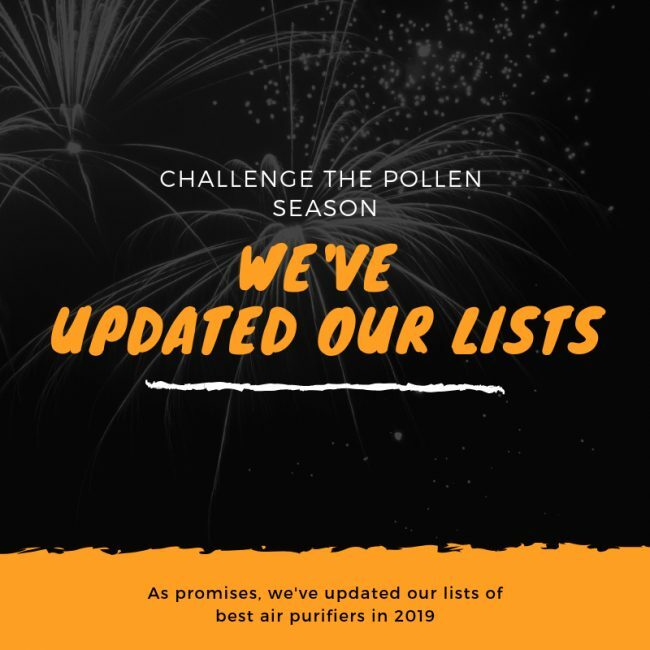 If you need an air purifier with a better room coverage: the Airpura UV600 can cover a room of 2000 sq ft, or the Austin Air Bedroom Machine and Oransi EJ120 are able to clean a room of 1500 sq ft. 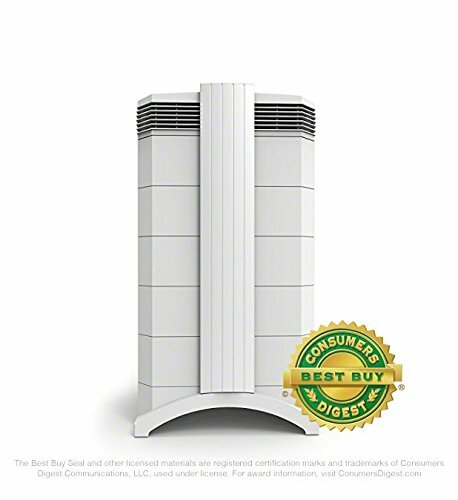 If you need a budget version of this air purifier: you can think of the Austin Air HealthMate Plus Jr, which is $410 less. Or if you can afford more, the Rabbit Air MinusA2 has great air filtration process with $300 less. The compact IQAir HealthPro Compact is also great, with $100 less. If you need a more silent air purifier: this is one of the best air purifiers for the silent, but you should also look for the Airpura F600, Airpura C600 or Airpura T600. If you care about the annual filter cost and energy cost: the IQAir HealthPro Plus is also a good option for energy-saving, and you can consider the Oransi EJ120, too. If you love the additional features: the IQAir HealthPro Plus is a rare air purifier with the Smart Sensor in this price range. A high-end IQAir air purifier again with a much improved HyperHEPA filter and lower price tag. Without a doubt, IQAir HealthPro Plus is the must-pick device when you are considering a high-range air purifier machine.